Topical Agenda for 2018 Re-Wire Policy Conference is now available! The Topical Agenda for our 2018 Re-Wire Policy Conference on December 13th is now available! 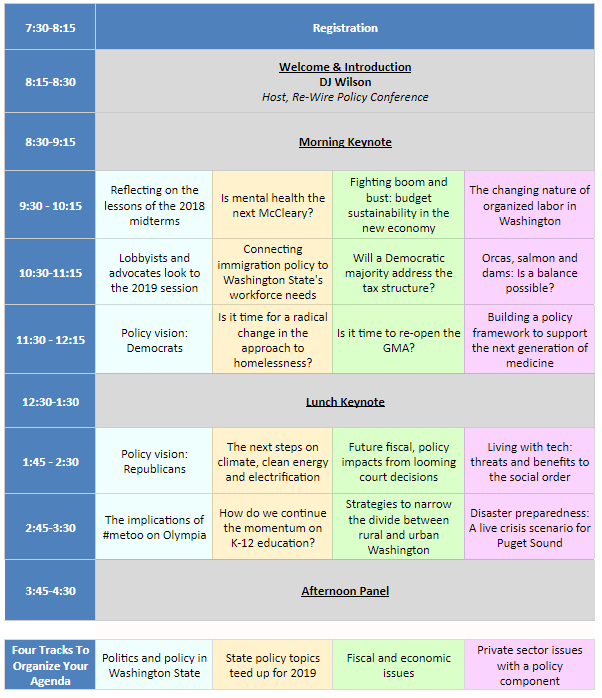 Like the Washington State Wire, the second annual Re-Wire Policy Conference is a non-partisan, policy agnostic platform for civil, civic discourse on policy, politics, and political economy. Our agenda is built with input from stakeholders across the political spectrum who represent some of the most thoughtful leaders and advocates in Washington State policy circles. You can view the entire Topical Agenda here, and if you have any suggestions on speakers or topics, we’d love to hear from you. If you weren’t able to join us last year, check out this highlight video of what you missed and be sure to register today. We’d be honored to have you join us!